Apologies to Ian for plagiarising his title. Catches were very sparse early in the week (Monday and Tuesday nights), picked up a bit last night but still nothing to shout about in spite of the super-abundance of other insects, mainly flies and beetles. 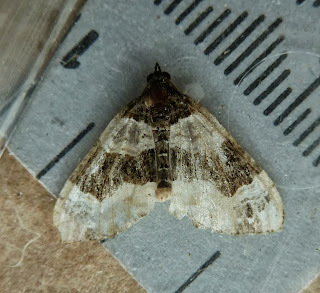 The most abundant moths were Silver Ys, Common Marbled Carpets, Spruce and Pine Carpets and Rosy Rustics, along with a few Angle Shades, Merveille du Jours and Black Rustics. 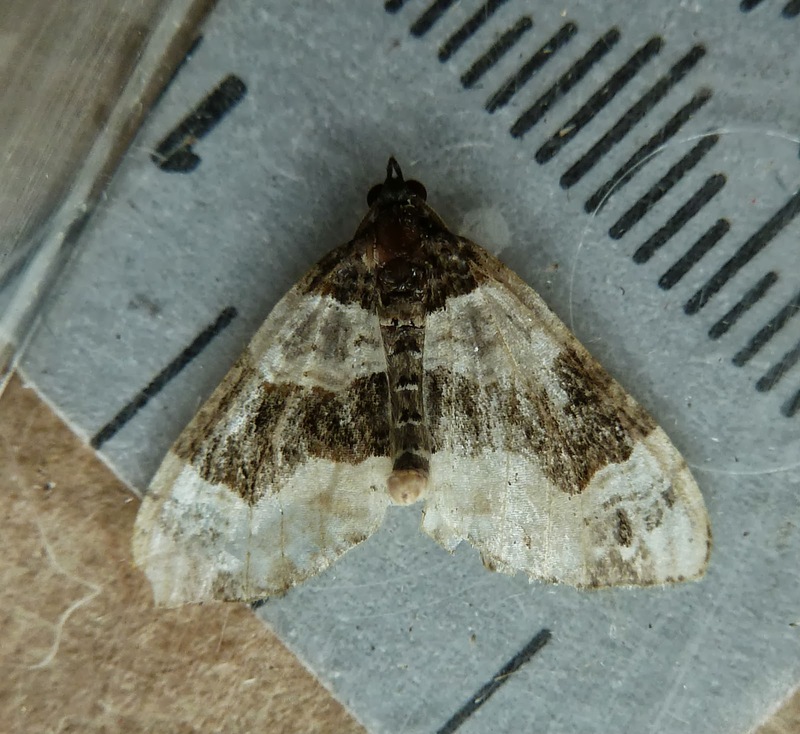 Two of particular interest this morning were a brown noctuid with deformed wings and a rather tatty carpet-type geometer. I'm fairly sure that the former is a Brown-spot Pinion, which I had in 2011 at much the same time of year (I believe that Sally has also had the species in Saron). As to the geometer, the shape of the central cross-band doesn't seem to match any of the Carpets I normally see here, and I wonder if it might be a Purple Bar, albeit a bit faded. The Tortricid is puzzling me (don't they always) and I wonder whether anyone can put a name to it. 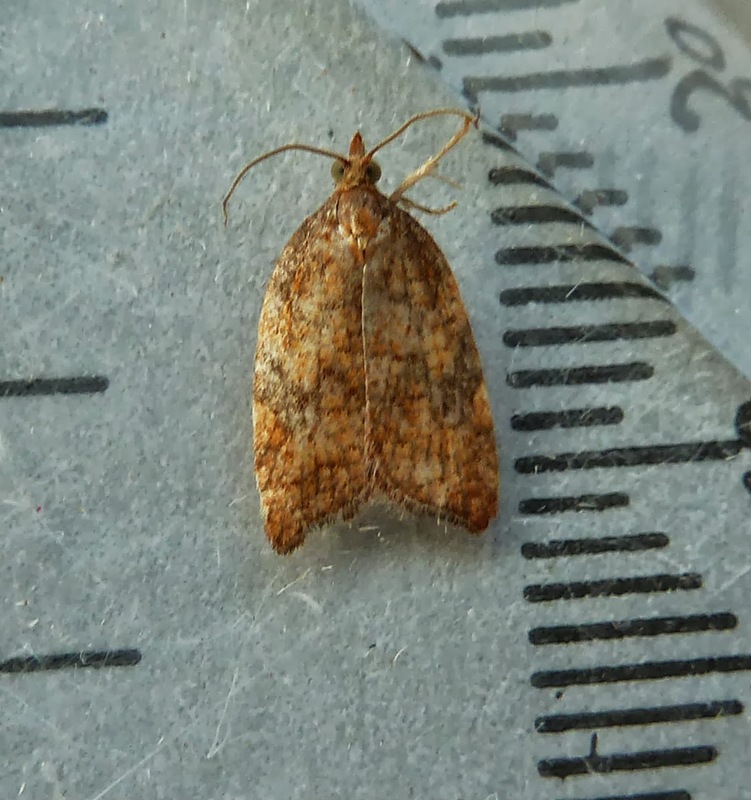 My suggestion would be rhomboid tortrix for the micro but hopefully someone more knowledgeable will confirm or deny! Looks like a brown-spot pinion to me. Whilst the background colour can vary, the dark bar at the base of the forewing is supposed to be diagnostic. Looks good for Acleris rhombana to me too. 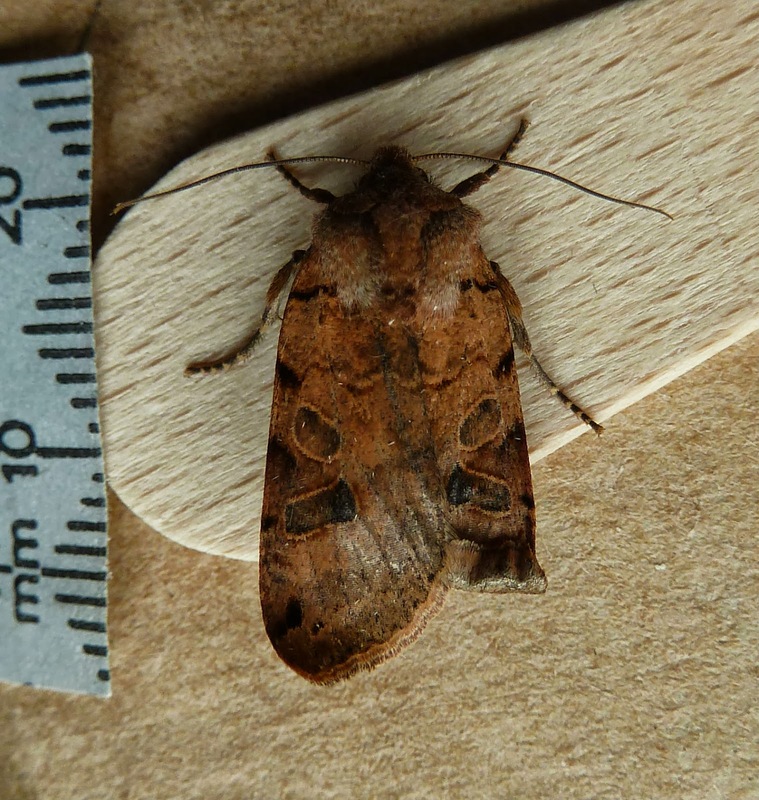 And yes, agree with Purple Bar and Brown-spot Pinion (the latter much declined - haven't seen one for years). Brown-spot Pinion is mighty rare in Carms - a good record! Thank you all very much for your reassuring comments. I note that the Brown-spot Pinion is listed in 'The State of Larger British Moths' as a species in significant decline - as is the Flounced Chestnut, which I've had on each of the last two nights' trapping. It's interesting that you haven't seen BSP for some time, George, I wonder if it's cropped up elsewhere in Glamorgan recently. Purple Bar is a first for me here, although according to Jon's Annual Reports it's quite common in the Carms. It's pretty rare in Glamorgan too - since 2000 there have only been records from the eastern Valleys (Aberdare, Merthyr Tydfil, Senghenydd).